Ala eh! 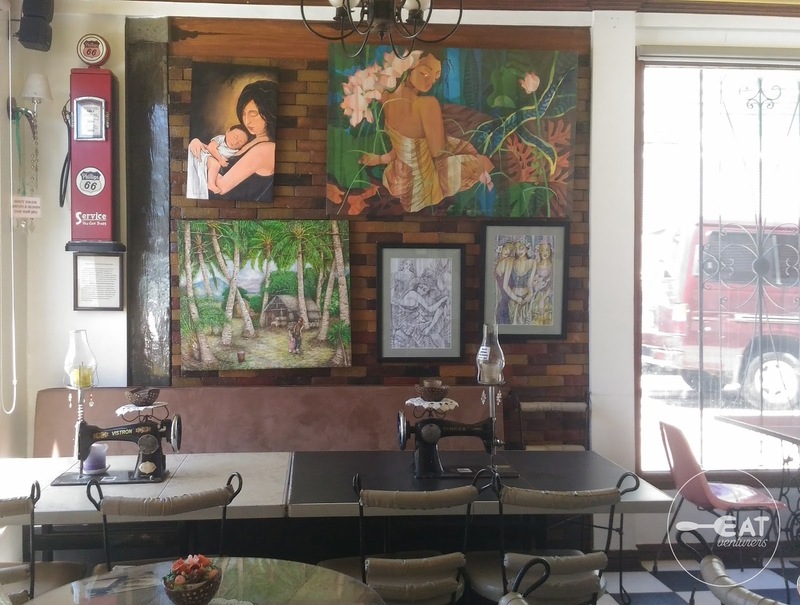 If you happen to be in Batangas this summer or Lenten Season, stop by this antique-inspired cafe standing in a century-old Spanish home, Cafeño. It is only a short drive away from your favorite beaches in Laiya! Cafeño is a gem of the Marasigan family. 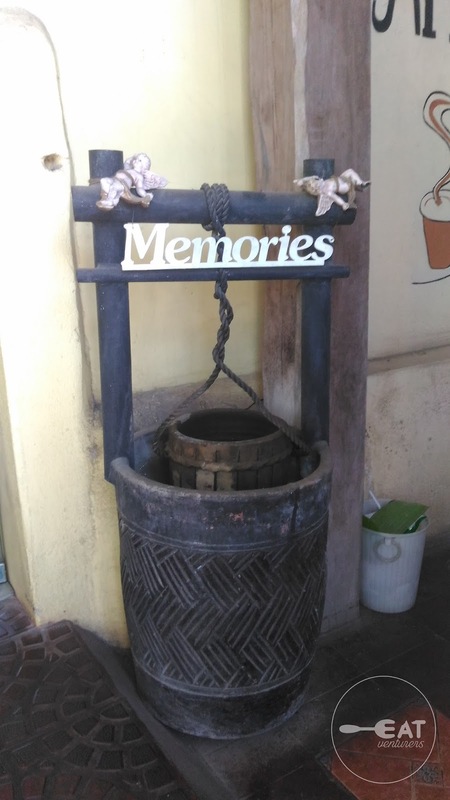 The place itself contains so much history. 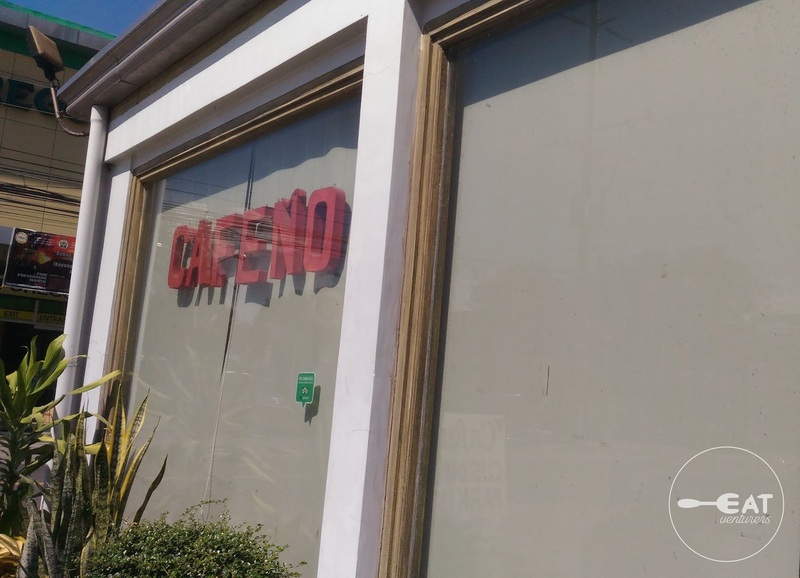 It used to be part of a gas station, owned and operated by businessman and former Congressman Apolonio Marasigan. Throwback: It used to look like this. Imagine this: first gas station in the town of San Juan, Batangas. It went through several challenges before it became Petron. In 2006, Cafeño was initially opened to cater to Petron's customers - a sip of kapeng barako to survive a long drive. It has paintings and antique decorations. 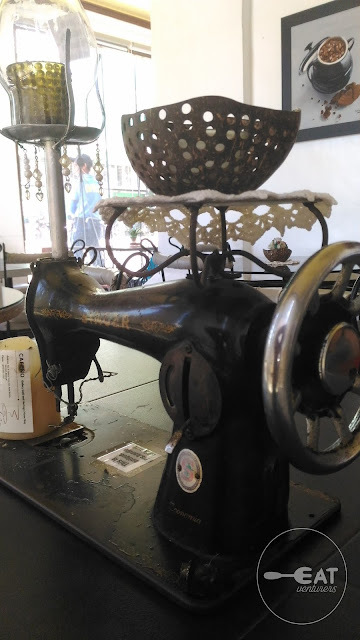 The most notable are the sewing machines placed on top of the tables. Have your breakfast here in Cafeño. 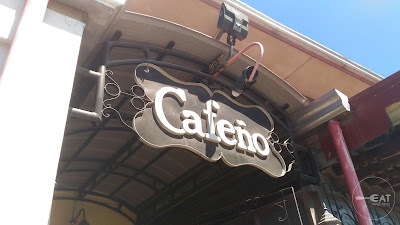 Some people come here just for their barako coffee. We are not coffee-drinkers but this is one of the best coffee we've tasted. Price range of food and drinks is from P50 to less than P200. For our main course, we ordered Tulingan Strips, Batangas Beef Tapa, and Chicken Mushroom Salpicao. 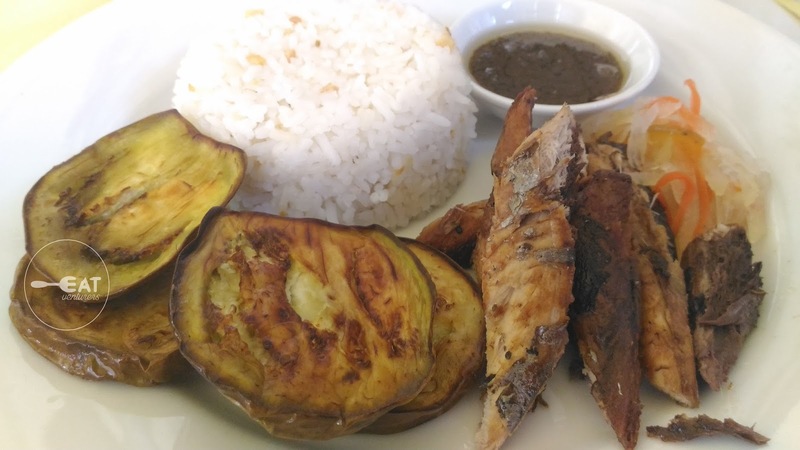 Tulingan (Mackerel Tuna) is particularly famous in Batangas. This is your typical Sinaing na Tulingan (braised or steamed), then fried. We suggest you to try this if you have no idea what it tastes like. It is also perfect for strict observers of Lent! It is served with atsara (pickled vegetables) and perfectly fried eggplants - caramelized, soft, but not soggy. 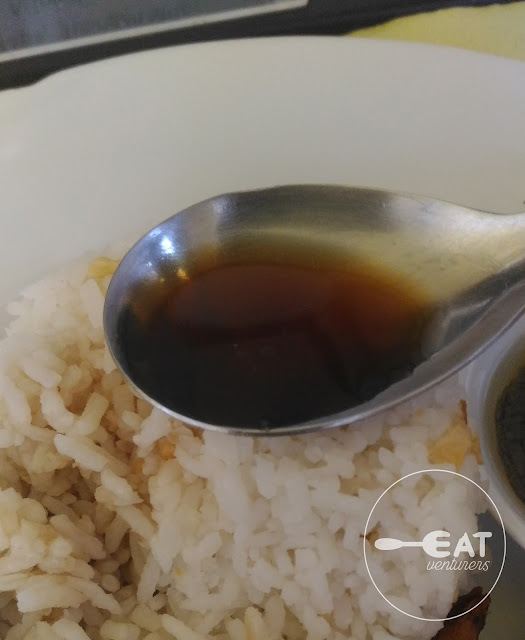 You can also pair their Tulingan with its special sauce: we're guessing it was Balayan Bagoong (Anchovies) with gata - but for us, it could be better described as something that tasted like Laing. This is also a healthier option to one of their bestsellers - Batangas Beef Tapa. 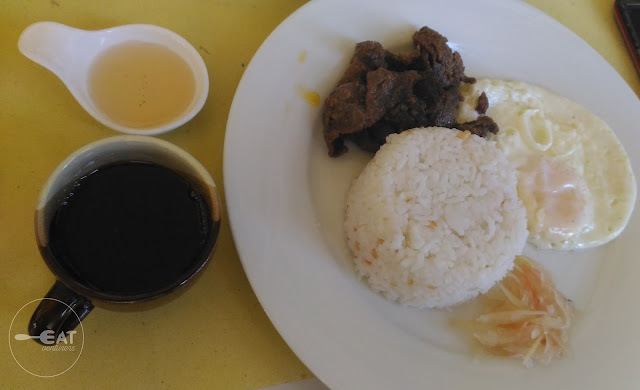 Their Batangas Beef Tapa is served with egg, atsara, and suka (vinegar). 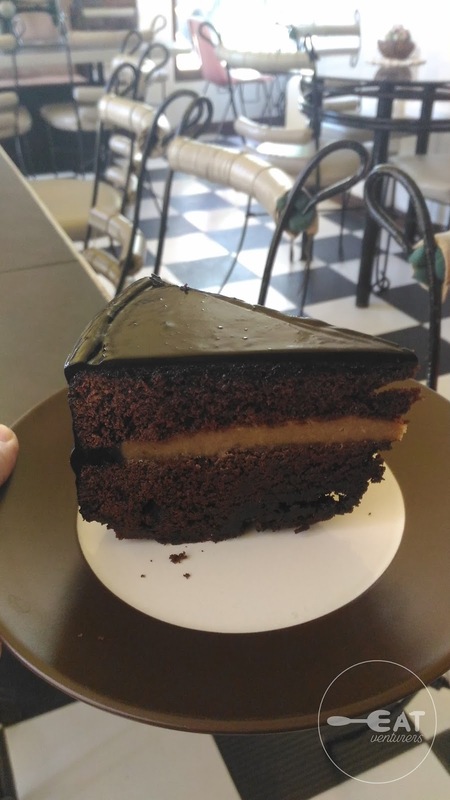 What's special about this is it is also served with a shot of their barako coffee. Pour coffee on your rice for a perfect experience. This is how Batangueños usually do it. 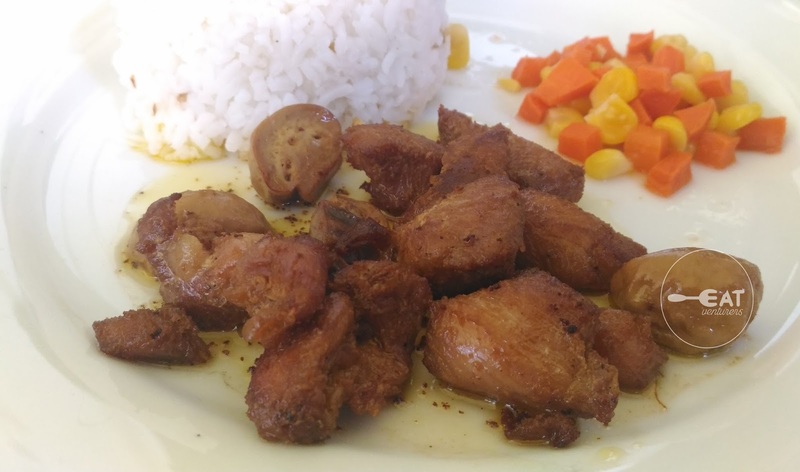 The Chicken Mushroom Salpicao, on the other hand, is also good. It is served with a side of corn & carrots. Serving is a little bit small though. For desserts we ordered Sweet Tamales, Chocolate Cake, and Ice Cream in a Cup: Barako and Banana Maple Flavor. You should definitely order Sweet Tamales when you visit. We are not sure about the authenticity of Tamales and its origin but their version is really good. 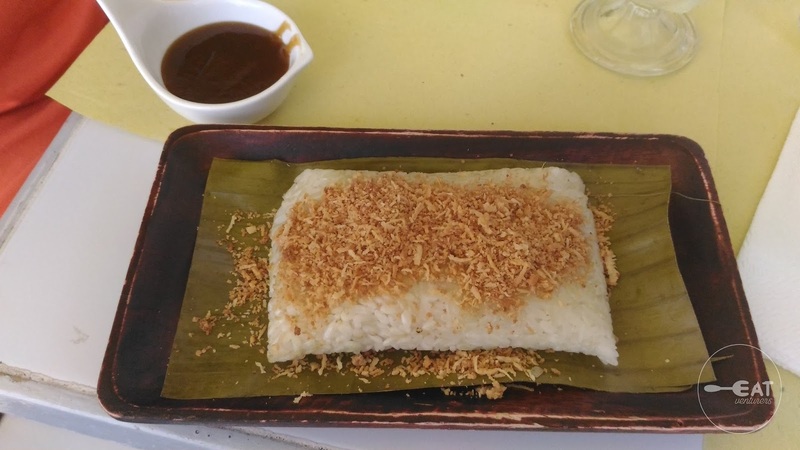 It is glutinous/sticky rice, steamed while wrapped in banana leaves. It is served warm with toppings of toasted coconut and a side of Latik, commonly known as coco jam. They probably make their own coco jam, traditionally thick. However, the Eatventurers prefer it to be diluted with a little bit of milk - just enough for it to be drizzled easily but can still coat the tamales well. We couldn't emphasize enough that this is really good. Pairing it with barako coffee makes it perfect. Their Chocolate Cake, on the other hand, is too dry for us. We didn't like the filling - it felt like yema which tasted like hopiang baboy. We probably just had a bad batch as this is also one of their bestsellers. 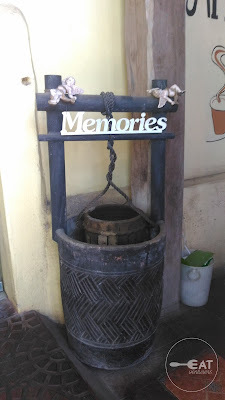 You can also try their homemade ice cream. These are all made from scratch and were all formulated by Ms. Sylvia Marasigan. 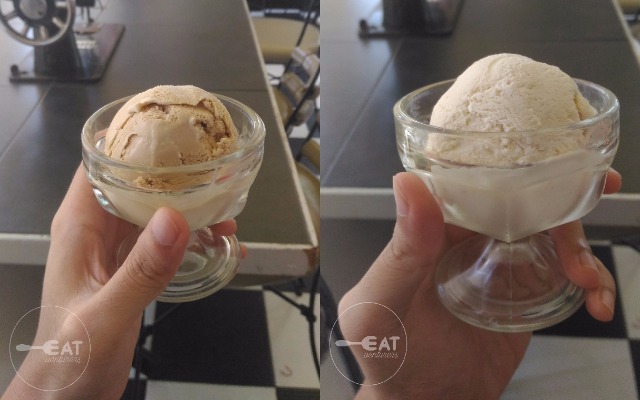 You can order by the tin can (P450) or scoop (P50). Unfortunately, other flavors weren't available so we only ordered Barako and Banana Maple. The Banana Maple is good. You can still feel tiny bits of banana. Service is bad, bordering 'they shouldn't be in the hospitality business'. They weren't smiling, there were a little bit confusion on our orders, plates weren't bused out when we were already eating desserts. They weren't even checking if we needed water. They were just standing there, talking to each other as if there weren't any customers. Meanwhile, the food was served fast so kudos to the back of the house. The front of the house really needs some training or they need to be replaced. As we always say, bad service is bad for business. Overall, you should definitely stop by this restaurant when you are in San Juan, are going to or coming from your beach trip this summer season! 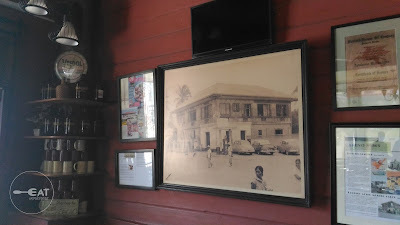 Heads up though, the restaurant announced in its Facebook account that they will be open the whole Holy Week, except for Good Friday (April 14) and they are also celebrating their 11th anniversary on Easter Sunday, April 16.